Mensch wiltu leben seliglich/und bei Gott bleiben ewiglich/Soltu halten die Zehen Gebot/ Die uns gebeut unser Gott. Man if you would live blessedly/ and dwell in God eternally/ you must hold the Ten Commandments/ our God commanded to us. 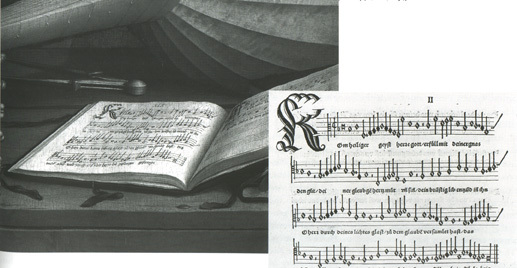 The representation of a Lutheran hymnbook and the juxtaposition of these two texts demands explanation. Such a selection seems intentional. A potential explanation is to relate these text to a principal theme of Luther's thought: the contrast between the Law and the Gospel, or Law and Grace. The Law, as the word of Moses directed to the outer life of man, proclaims the abject state of man before the wrath of God. Through the Law comes knowledge of sin. As a result of his disobedience, man is the prey of death and the Devil. In opposition, the Gospel, as the word of Christ addressed to the inner life of man, offers the promise of righteousness and salvation. The contrast between the Law and the Gospel is directly tied to one of the central tenets of Luther's theology, Justification by Faith. Man can be justified or saved only by faith as a free gift of divine grace alone without merit or dependence on the works of the Law. This doctrine is developed in Luther's preface to his Commentary of Paul's Letter to the Romans. Since all, whether Jews or Gentiles, are found guilty in their works before God, no flesh will be justified in his sight by the works of the law. But let him who keeps the works of the law throughout his life be troubled. By those works, indeed, he will be righteous, but by a legal righteousness-- I say "legal," whether it be of the law of nature or of the written law. But he is still not justified, still not the possessor of that righteousness from which he is able to have eternal life; for it is God alone who provides this righteousness though faith and who justifies by grace alone [sola gratia] unto life eternal. 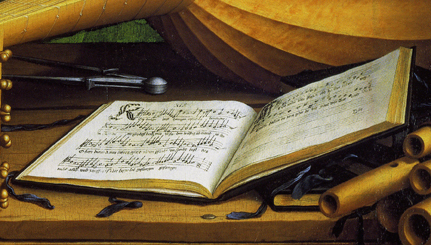 The writings of Georges de Selve reflect the importance of the question of Justification. Returning to The Ambassadors, the decision to include Luther's paraphrase of the Ten Commandments corresponds well with the Law, especially since the passage quoted contains an admonition to obey the commandments. In contrast, Luther's translation of "Veni sancte Spiritus", containing an invocation of God's good grace, echoes the theme of the Gospel. The verse represented finds parallels in Georges de Selve's appeals for a spiritual peace, where all are rejoined and reunited in Christ. The theme of Law and the Gospel was given visual form as early as 1529 in a panel painted by Lucas Cranach the Elder and gained wide popularity in the visual arts. * Holbein used this theme of Law and the Gospel in at least two works: a panel in the National Gallery of Scotland and the first title-page of the Coverdale Bible published in 1535. 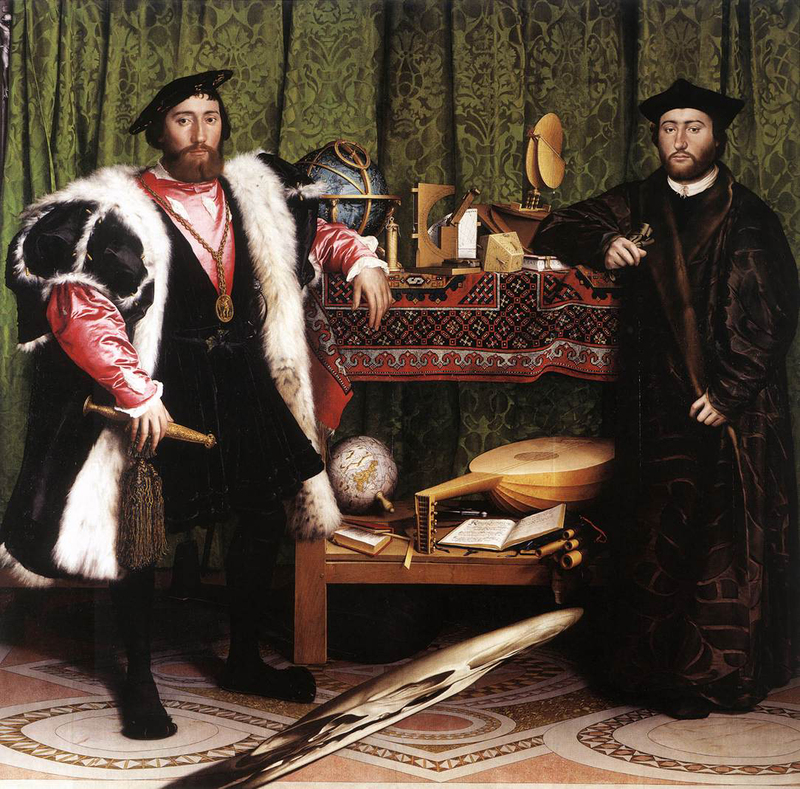 Holbein's images echo representations of the same theme by from as early as 1529. A variation of the theme was used for the frontispiece of Lefèvre d'Etaples' French translation of the New Testament, printed at Antwerp by Martin Lempereur in 1530.